The Sumo is one of the most coveted and affordable diving watches made by Japanese manufacturer Seiko. This watch boasts high-quality workmanship, water resistance to 200 m, and a robust, automatic in-house movement. 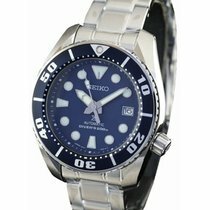 The Seiko Sumo is known among watch enthusiasts as a popular, high-quality, and nonetheless affordable diving watch. As its name suggests, this wristwatch is relatively large. The 45-mm case is indeed rather sizable, but overall the watch doesn't come across as particularly bulky as it is only 13 mm thick. The unidirectional bezel, useful for keeping track of dive time, is set into the case, which contributes to the watch's relative slimness. In addition to its size, the position of the crown at 4 o'clock is another distinguishing feature of the Seiko Sumo . Within the Prospex collection – the collection name stems from "Professional Specifications" – the Seiko Sumo falls in the middle range of prices. It is a bit more expensive than the Turtle, but considerably less expensive than the Marinemaster. To the untrained eye, the Sumo differs only slightly from the Marinemaster 300. Thus it presents an affordable alternative to the more pricey professional diving watch. How much does a Seiko Sumo cost? 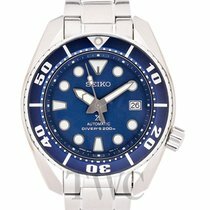 Prices for the Seiko Sumo start around 450 euros for standard models with reference numbers SBDC031 and SBDC033. 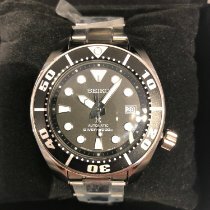 The Seiko PADI Ref. SBDC049 is limited to 1,000 pieces and is considerably more expensive at around 1,000 euros. In celebration of the 50th anniversary of its diving watches, Seiko released several other limited editions in 2015. Among these is the Sumo model with reference number SBDC027, which was limited to 2,000 pieces. The 50th Anniversary Model of the Sumo was fitted with some upgrades, raising the quality above that of the standard models. For example, scratch-resistant sapphire glass gives wearers a clear look at the display in the upgraded model, whereas Seiko's Hardlexglas shields the display in the standard models. Additionally, the case of the SBDC027 is protected from small scratches by a Dia Shield coating . The design of the bezel is more reminiscent of the higher-end Marinemaster 300 than the other Sumo models. The shape of the hands and hour markers also differs. The Anniversary Model has indices instead of the large dots that typically mark the hours on Sumo models, and slimmer, rod-shaped hands replace the sword hands of the standard variants. The list price of the Sumo SBDC027 was around 1,000 euros at the time of its release in 2015. However, due to its limited run, this model is rather difficult to come by. The case of the Seiko Sumo is finished to a high standard and can easily hold its own among Swiss luxury watches. It is superbly polished and satin brushed. Even the in-house movement 6R15 is lightly finished, despite being hidden behind a large, screw-down case back. Thanks to this case back and the screw-down crown, the case is water resistant to 200 m (20 bar). The fluted crown is easy to use, as is the unidirectional diving bezel, which can only be turned counterclockwise for safety reasons. The standard models SBDC031 and SBDC033 feature either black or blue dials and bezel inlays. The brand inscription is located under the 12 o'clock position, and over 6 o'clock there is a large X signifying the Prospex collection. Beneath the X, the words "Automatic" and "Diver's 200m" are written. The date display is situated at 3 o'clock. The three hands, the hour markers, and the zero marker of the rotating bezel are all coated with glowing LumiBrite luminescent material . Lumibrite ensures that the time can be read easily in the dark or underwater and is said to glow longer and more brightly than other comparable materials. The lug for the bracelet is 20 mm wide and thus appears rather slim on this large diving watch. The stainless steel bracelet is well made and has a fold-over buckle with a security clasp and brackets. However, the bracelet is still not quite up to the overall high standard of workmanship of the Seiko Sumo. Luckily it can easily be replaced with a NATO or silicon strap, for example. The latter cost around 50 euros. The Japanese in-house movement 6R15 ticks away inside of the Seiko Sumo. It consists of 168 individual parts and 23 jewels. The power reserve lasts 50 hours and thus surpasses the frequently-used Swiss ETA caliber 2824 by 10 hours. The 6R15 has a date display, can be wound by hand, and has a stop-seconds mechanism allowing the time to be set to the exact second. The deviation is a generous -15 to +25 seconds a day according to Seiko, meaning that it does not run as accurately as Swiss chronometers, which typically have an average daily deviation of -4 to +6 seconds. On the wrist, however, many Seiko watches are very precise and deviate only a few seconds a day.